This Thursday, September 11, we're headed back to Crocker-Con! Get your tickets online or at the door. Cosplayers get in FREE; otherwise, it's $10 to get in, and students get $2 off. Crocker Members get in free. 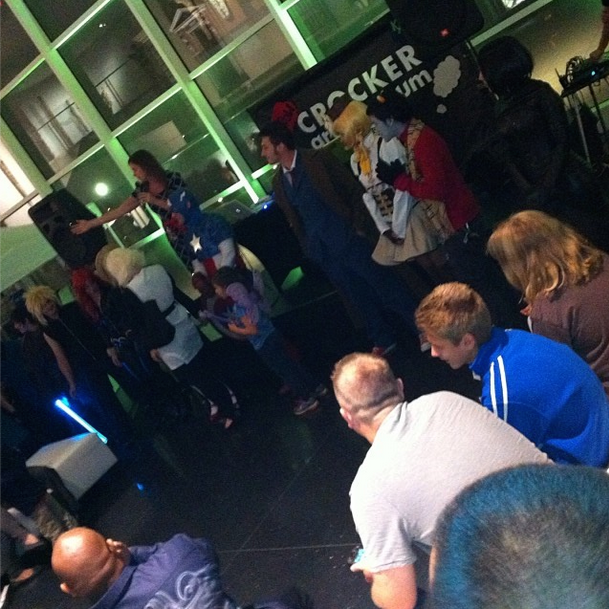 For more information, check out the Crocker's FB Event for Crocker-Con. Did we mention drink specials under $5!? This year Crocker-Con is also taking over the courtyard in order to make this festive event both indoors and out! The Sleeprockers (video below | @sleeprockers on Twitter) will lay down some fresh beats with a special nerdcore set. The Crocker's FB event page adds that you'll enjoy "featured artists from DC Comics, Marvel, and Dark Horse Comics; hero-inspired art talks; and a special appearance of those legendary bad guys who do good, The 501st Legion." You've already heard that Empire's Mobile Lounge will be busting out the Jenga-thon, so all that's left is a Twitter list of attendees (coming soon). See you there.